The hand of the Lord has been evident in Wael Farouk’s life from his childhood in Cairo to today as the first pianist ever to perform all ninety-eight of Sergei Rachmaninoff’s solo piano compositions within six months. That’s similar to an actor performing all of Shakespeare’s plays in one season, he says. What makes this achievement even more remarkable is that he was once told he could never play the Russian composer’s music because his hands could not be straightened or even made into a fist. Yet the thirty-three-year-old has performed in New York City’s Carnegie Hall. He also accompanies worship at his home church, Grace OPC in Hanover Park, Illinois. 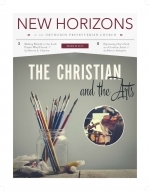 Music became both Pamela York’s vocation and her introduction to Christ. When the editor asked me if I wished to write on the value of listening to and attending the opera, or of listening to and attending the symphony orchestra, I felt as if he had asked a gourmand to write about food. I readily agreed and was delighted at the prospect! Discovering the Reformed faith gave Mike Mahon the freedom to pursue his calling as a landscape and portrait painter. He began studying fine arts at Texas Tech University in the late 1960s. But he quickly became disillusioned because “all anybody was interested in doing was making philosophical or political statements.” Also, most artists embraced abstract art and dismissed traditional painting and concepts of beauty.